This past week the Dusk Till Dawn Poker Club in Nottingham, England announced it had its eyes set on the UK poker record for the largest field ever in its upcoming Grand Prix tournament –a record the club set and then lost last year. Now the Dusk Till Dawn Grand Prix will have to pull in even more players as the PokerStars UKIPT Nottingham event destroyed the previous record. The record, which stood at 848 players and was held by the PokerStars EPT London, was blown out of the water this weekend when the UKIPT Main Event attracted 478 players on Day 1a and 580 on Day 1b, for a total of 1,058 entrants! The £500 buy-in tournament saw the total prize-pool swell to £529,000, with a first prize of £109,000. 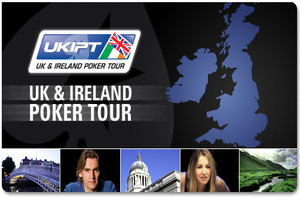 One factor that may have led to the huge turnout is that Chanel 4 in the UK will be televising the UKIPT tournaments with PokerStars Pro Liv Boeree and Nick Wealthall co-hosting the telecast –Televised poker tournaments tend to have extremely large turnouts since the chance for mainstream exposure is exponentially larger. I’m sure Dusk Till Dawn is now thinking of even more ways to attract players to its €50 buy-in tournament, as it’s no longer a given that the Grand Prix will best the record even with five Day 1 flights scheduled. This entry was posted on Sunday, February 13th, 2011 at 10:39 am and is filed under Poker News. You can follow any responses to this entry through the RSS 2.0 feed. You can leave a response, or trackback from your own site.